With nearly 400 stores across five countries, we're a one-stop source for domestic, international, and freight shipping services. 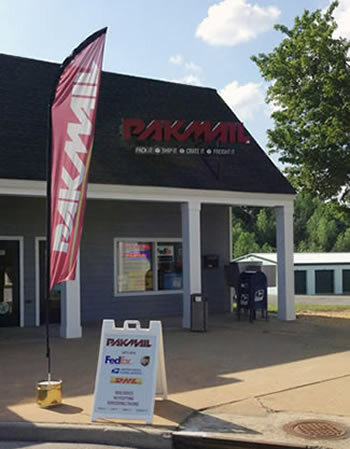 When you visit your local Pak Mail in Manakin-Sabot, we'll find the most cost-effective, safe way to pack and ship your items, whether it's by air, ocean, or ground. Shipped a large antique tv/phono/radio unit to Fla. Pak Mail took care of it all. No problems. Unit arrived in a timely manner and in good condition. Would use Pak Mail again. The service in a word was "perfect". Welcome to Pak Mail RVA! Pak Mail RVA is the most complete packing and shipping business you will ever use. Have something large and awkward to ship? How about getting the best value for small package shipping? We help our customers do everything from sticking a stamp on a letter, to packing and shipping delicate crystal, to crating heavy machinery going overseas. When you ship with us, you'll have the opportunity to compare our negotiated rates from our preferred network of carriers (DHL, FedEx, UPS, USPS, and more) and numerous delivery options to provide you with a reliable and efficient delivery method. Select from the top carriers to ensure safe and secure delivery each and every time. Whether you need to ship a grandfather clock, electronic equipment, a small apartment or artwork. Pak Mail RVA is a full service packing and shipping store as well as a custom crating and freight shipping company. We are located in Manakin-Sabot and proudly serve the Manakin-Sabot and Richmond areas. Request a Free Online Estimate or call us at 804-708-0945.